XXL Diamonds designed by Sylvie Meuffels and Jasper van Grootel is a sequel collection to one of JSPRs signature collections – the Diamonds. This time bigger, brighter and more impressive. The new XXL diamonds allow you to make a bold statement in any desired space, perfect to spark up any private or public interior. The naturally elegant shape of a precious stone makes for a spectacular eye catcher. 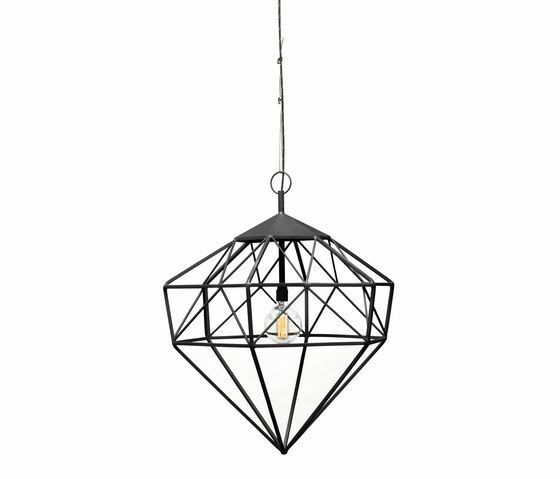 Crafted from square steel bars and powder coated in matt black, each piece is delivered with black textile cable and stainless steel support cable. Custom colours upon request. Color: Black, Custom colors on request. Material: Powder coated steel. Standard delivery with 5 meter textile electricity wire. Who: JSPR, a Dutch interior design brand which is specialized in creating very remarkable products series and interiors.